Everybody likes that sweetness, but you can only take so many bites of it before you overwhelm your palette. 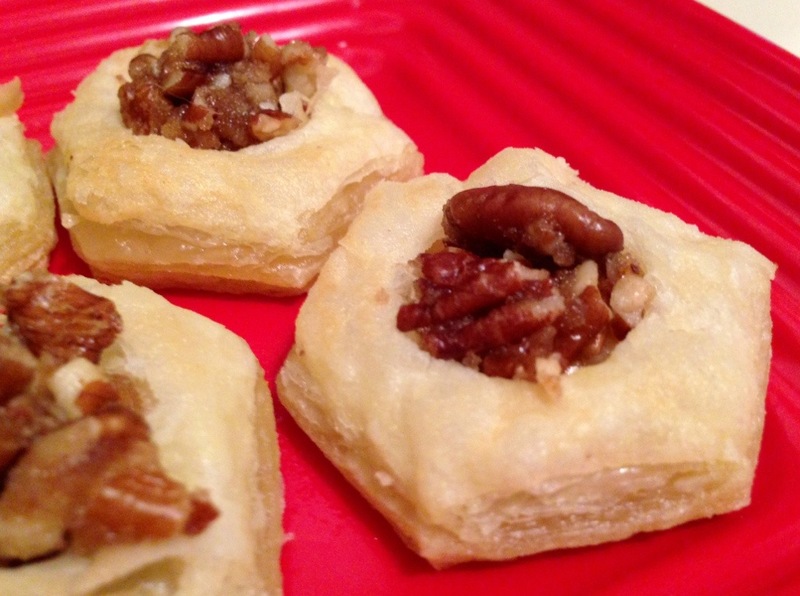 That’s why when I saw Hungry Girl‘s recipe for mini Pecan Pies, I thought “Of course!” Bite-sized is better for this dessert. I’ve done quite a few mini pies though, and for this one I wanted to try more of a tart/ pinafore bite. So I chose a different phyllo dough, and I’m glad that I did. -Preheat oven to 400 degrees. Prep your dough as you like, i.e. 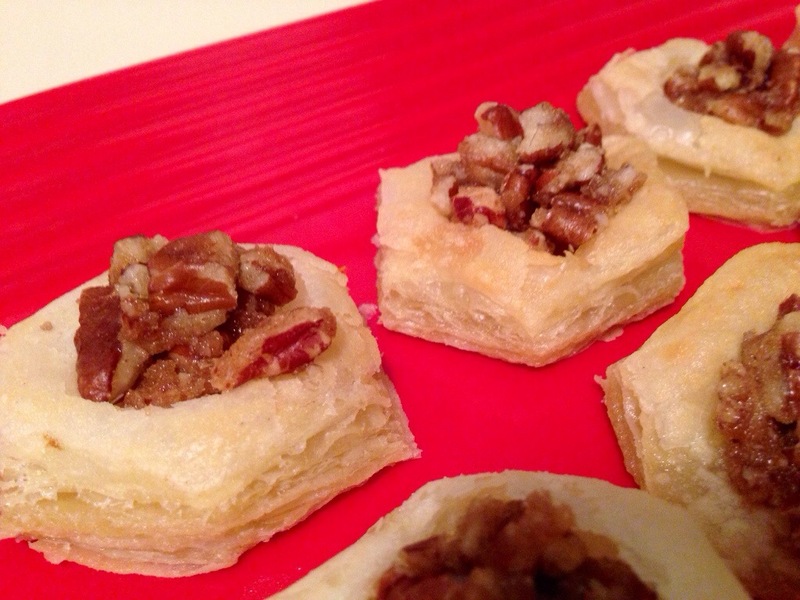 if you bought the mini pie crusts, assemble those. 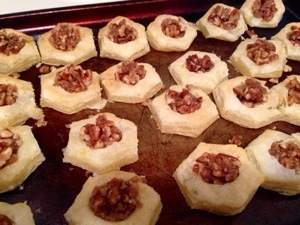 Place in preheated oven until slightly golden brown (about 5 minutes). -In a pan, drop in nuts and oil, making sure the nuts are coated well. Then add the remaining ingredients. 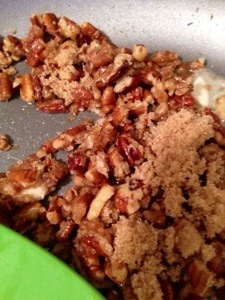 Turn over until nice, sweet and crunchy sugar layer forms. 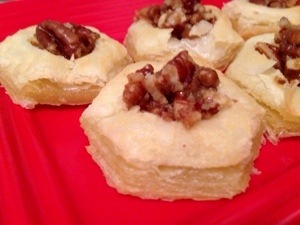 -Assemble the tarts by spooning your nut mixture into the centers of the tarts, filling to the top. Return to oven and bake another 5-8 minutes or until toasted and golden brown. Serve warm if you can, with whipped cream or mint garnish, if you like. Happy Monday! The day that follows the best day of the week, in my opinion, Sunday, when we recognize the importance of relaxation. No work is to be had on Sunday. I wish I could say I was better about obeying that commandment, but I’m not. What I am good at doing on Sundays is caring for myself however I see fit. Usually, this means some time spent talking to my higher power in church or alone, watching 60 minutes, relaxing before the week to come, and spoiling myself with something really delicious for dinner and dessert. People like the cute “Sundaes on Sunday” idea. Me, too. But I like mine wholesome and nutritious. I’m not saying that’s for everyone, but let me send a little divinely delicious inspiration your way. You’ve probably heard by now that frozen banana chunks are so sweet and smooth it’s like biting into ice cream. If you follow this blog, you’ve read about my successful experimentation with this and with freezing yogurt for homemade froyo. Both have major yum factor. So I started putting them together. 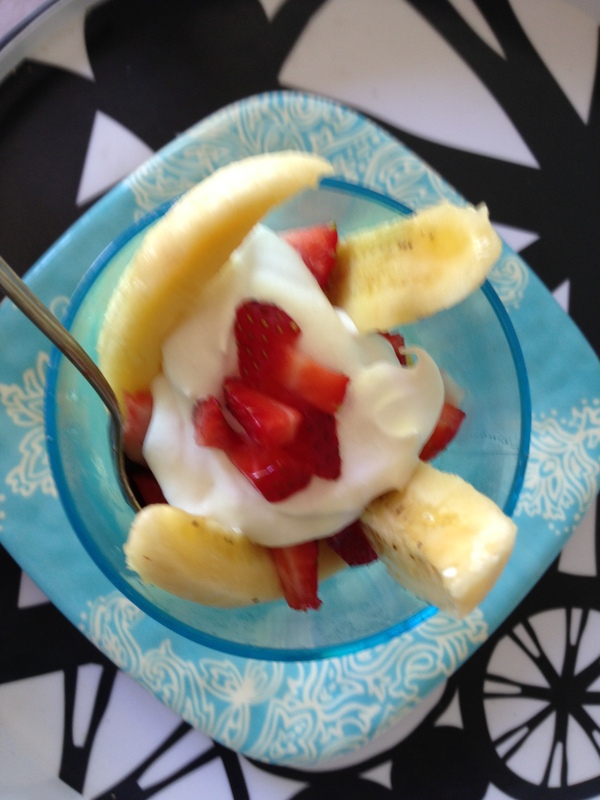 With some fresh strawberries, of course–and in another instance, dark chocolate chips–and just made an all frozen, holistic banana split I like quite well. optional: chocolate chips, nuts, etc. Slice the banana to your likely. For a split classic, I split mine down the middle and then in halves to fit in my dish. 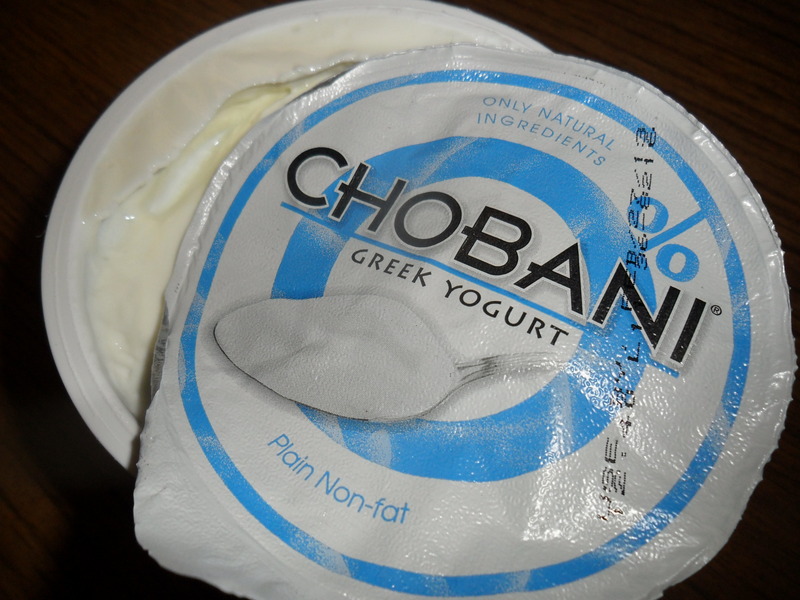 You might also chop or chunk them and layer your yogurt on top. Next comes the yogurt. Top or drop as you like on your banana split slices or chunks. Last is the berries. Sprinkle as desired. There’s a bad apple in every bunch. And there’s often a lot of bad bunches of produce. It’s especially true these days. It can be so hard to find a bunch, bushel, or bag of fruit that’s not bad. As someone who eats an exorbitant amount of fresh produce on the regular, I know this to be true. I sometimes wonder if producers know that American markets know nothing about picking ripe, fresh produce. I’m no expert, by any means, but for all the time I’ve spent picking out produce, I’ve come to question this. The positive is that I’ve also learned a few how-to’s along the way. Sometimes when I’ve had one too many bad picks–pale, tasteless grapefruit and old, flavorless spaghetti squash being the biggest repeat offenders–I look online for tips. Other times, I look to whoever is standing close to me and looks like they know what they’re doing. So when I was standing at Hy-Vee contemplating cantaloupe, I asked the woman to my right, who was also thumbing through, thumping, and smelling every melon in the bin. And let me tell you, she knew what she was doing. In an all-business tone, she let me know that a nice golden rind is going to be the freshest, juiciest, most flavorful pick. She was also frustrated that we couldn’t smell them. I knew about the smelling-for-sweetness trick, but what she told me next surprised me: If they wash them well, you can’t smell them for ripeness; the smell gets scrubbed off. Did I pick a winner? And then I turned 1/4 of that Candy Cantaloupe into this: Pops! You know I’m a popsicle fiend, especially during these hot summer days. 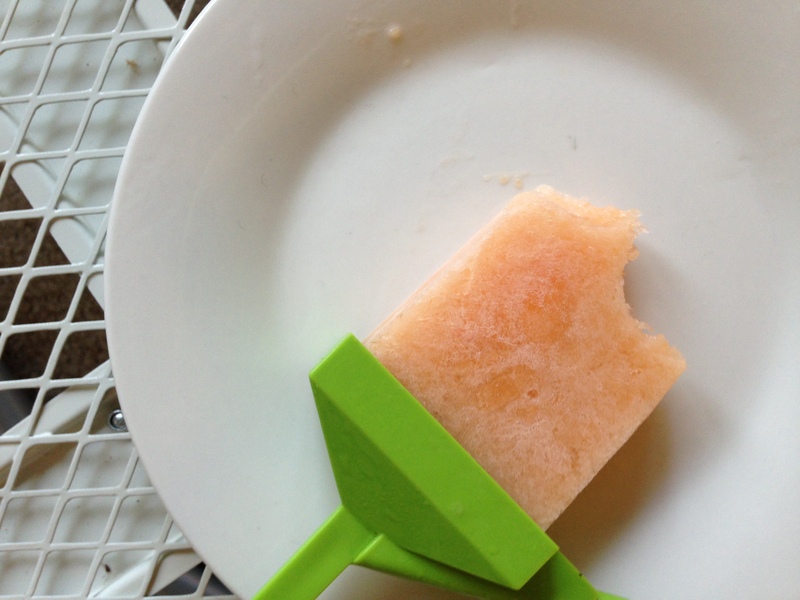 So while I resist faux coolant, I find a pleasurable defense in popsicles. And these ones are good! 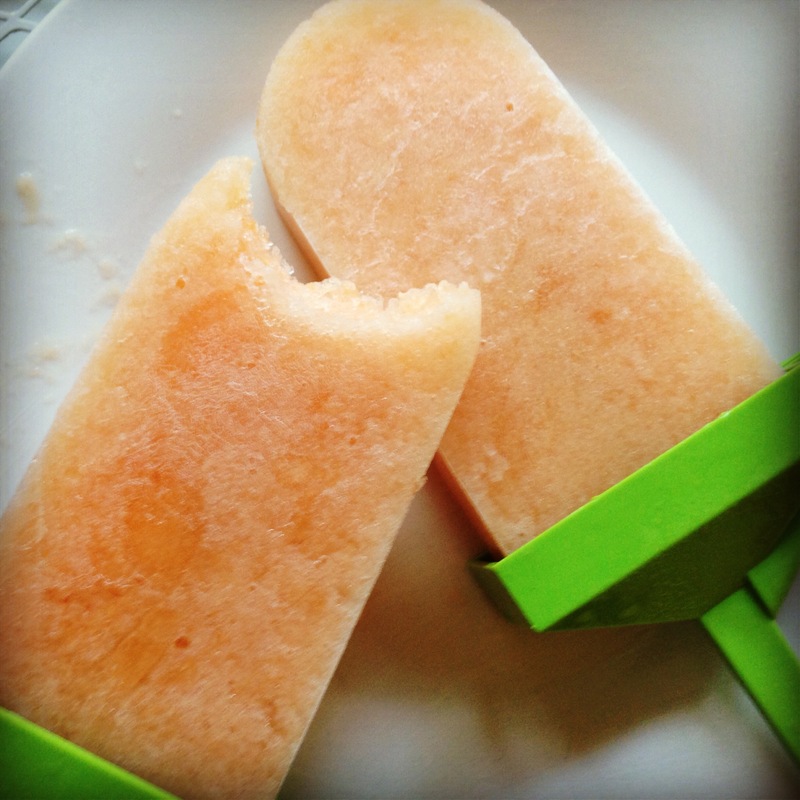 I know I say that often, but seriously, the cantaloupe, a little stevia for sweetness, and a little yo for smoothness makes this recipe better than any Dreamsicle I’ve had. Cross my heart and have my cantaloupe if I’d steer you wrong. Try it! 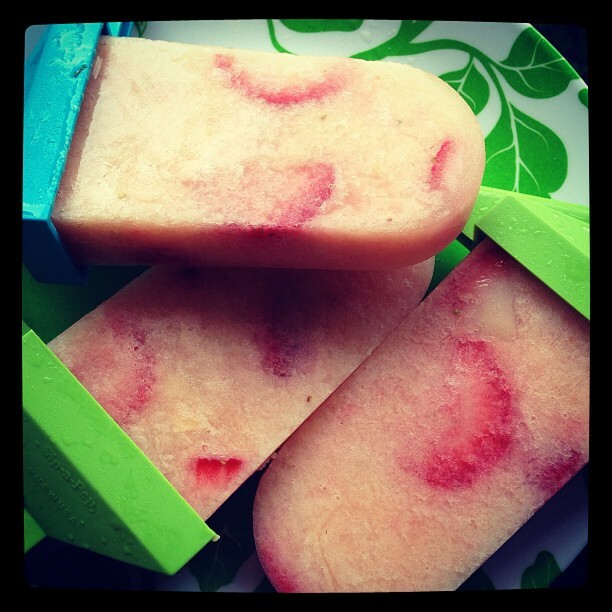 Makes 4 medium-sized popsicles or six small ones. Cover of Pops! by Krystina Castella whom I interviewed for a summer 2011 feature in the Kansas City Star. Click the image to link to that story. So easy. Place your fruit and all other ingredients in blender. Blend ’til smooth. 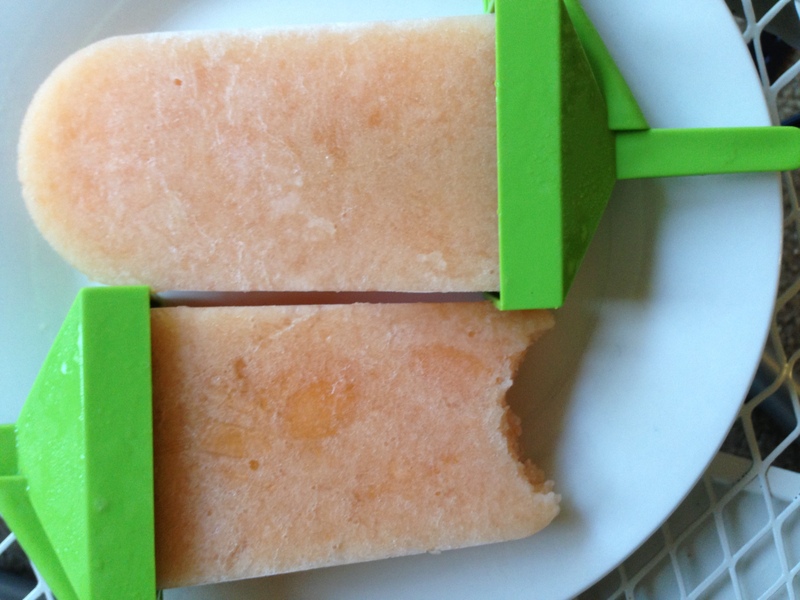 If you like, drop a few more thin slices of cantaloupe (or other pretty fruit, like orange slices without the rind) down the sides of your pop molds and then distribute your blended concoction evenly between the molds. Freeze for 3-4 hours or until solid. Ever since I interviewed Pops! 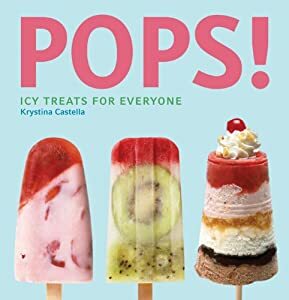 author Krystina Castella in 2011 for the Kansas City Star, I’ve begun to associate the coming of summer with the coming of fruity, sweet popsicles. 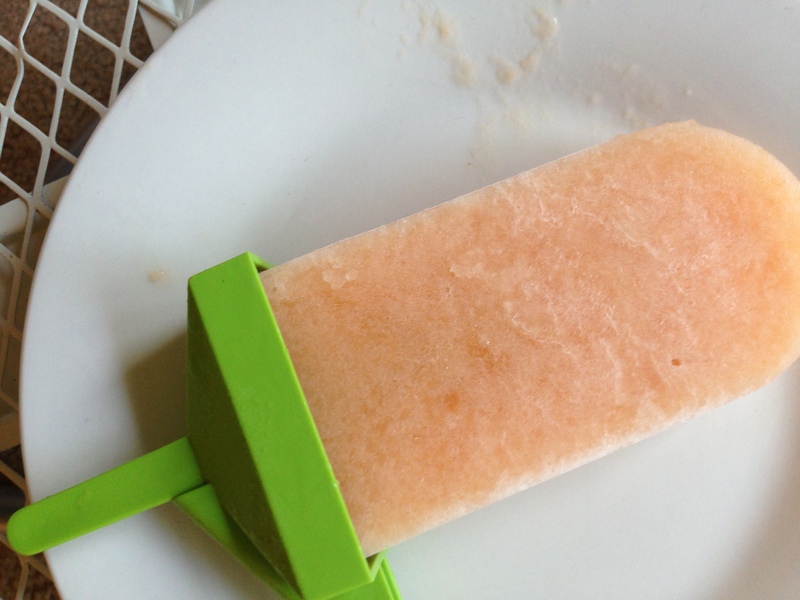 I’m sort of anti-AC, so a cold sweet pop on a sticky hot day tastes like heaven. 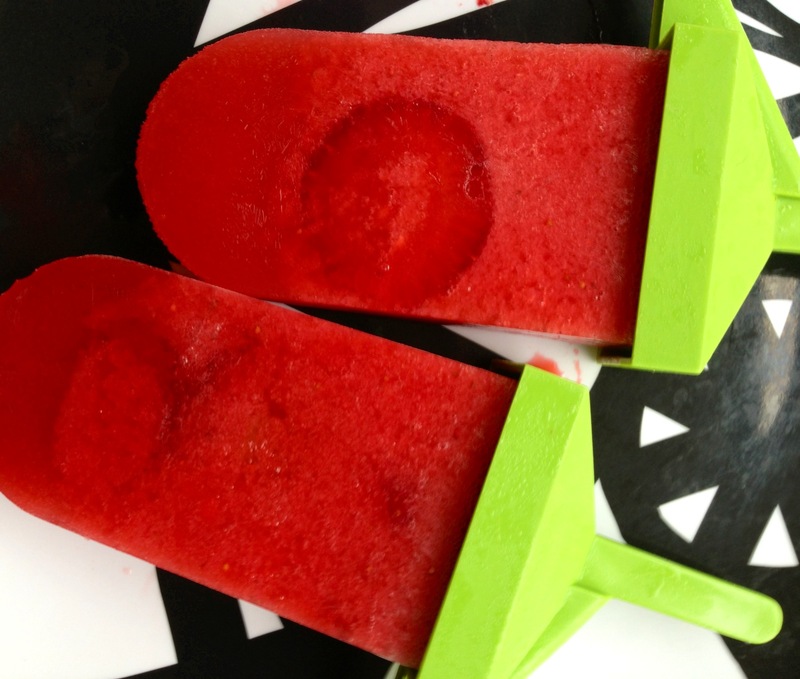 Plus, after you chat with a pro-popsicle innovator about how much thought can go into one simple pop, you gain a new appreciation for these simple sweets. 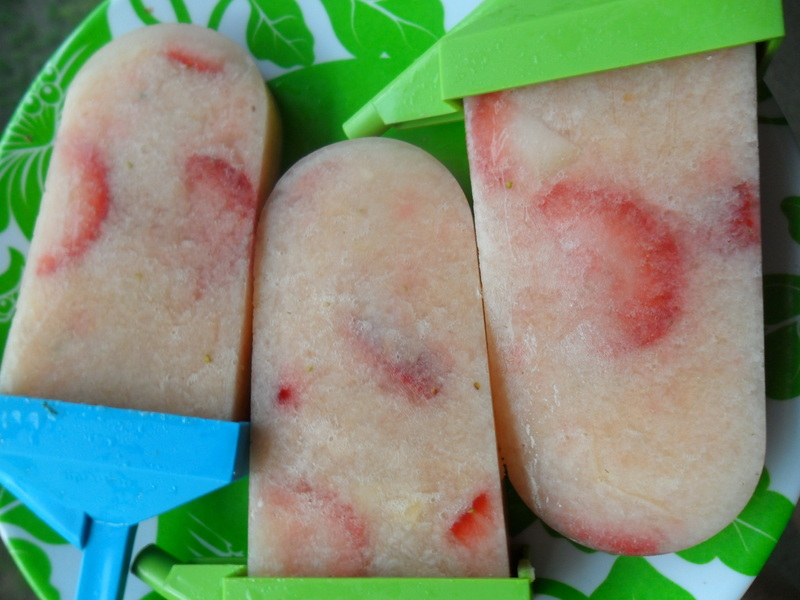 I look forward to blending, pouring, and freezing new flavors to try and it’s made all the easier when you know exactly what makes for a tasty, easy-to-remove, attractive looking popsicle. If you’re interested, read my 2011 story by clicking here. Castella is actually a college professor with a background in structural design. At the time, she was teaching and writing the book–when I talked to at least–and so she put a lot of thought into what makes for a beautiful structure, form that follows flavor, and entertaining on a purpose. Very smart and savvy, that one. These pops, they aren’t particularly smart or savvy. But they are good. And easy to make. Everybody loves strawberry lemonade in the summer, myself included, so I put it in pop form. So easy. 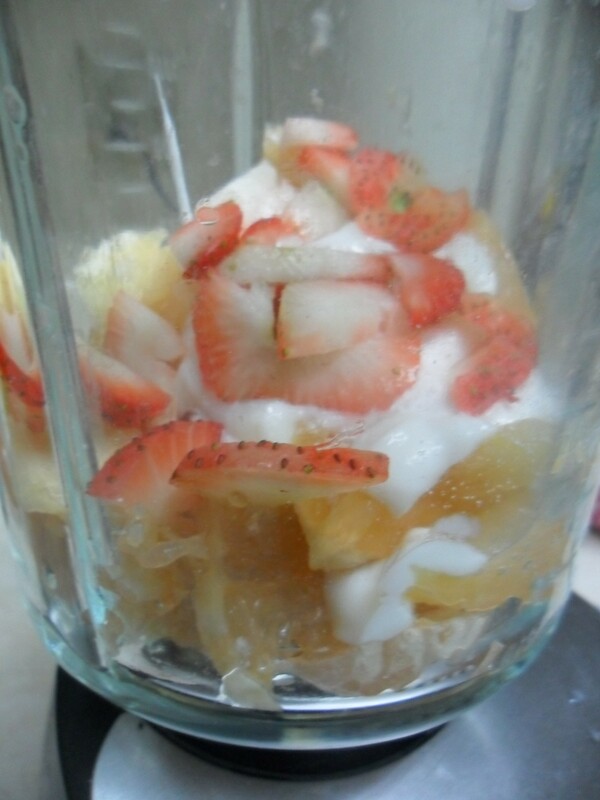 Place your grapefruit and almost all the strawberries in the blender. Blend ’til smooth. Squeeze a few lemon slices over the top, and then add in vanilla extract, stevia, and VZ0 Lemonade. Blend again until perfectly smooth. 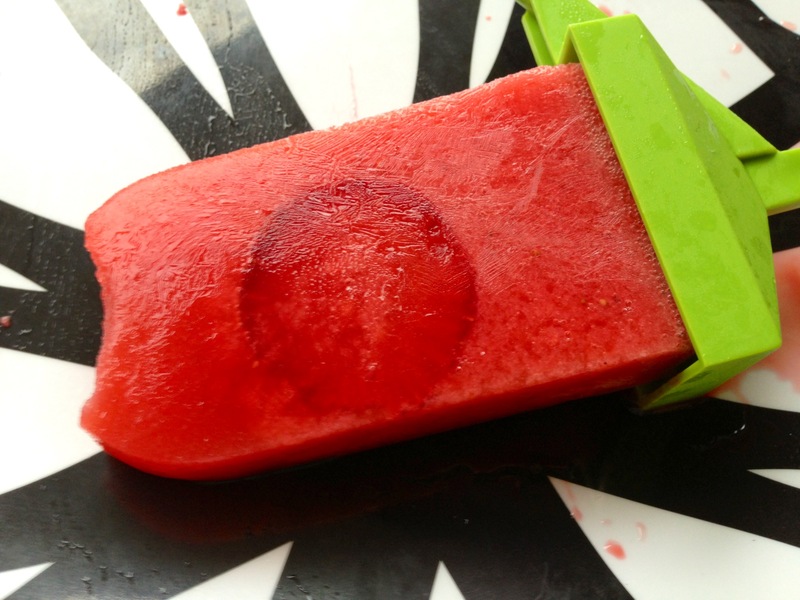 Drop a few slices down the sides of your pop molds and then distribute your blended concoction evenly between the molds. Freeze for 3-4 hours or until solid. Sparkling citrus makes me think of summertime, and strawberries make it a little sweeter. So I fed my Vitamin-C fettish with this little pop and I’m so glad I did. The recipe is below and so easy. A foolproof, must-try treat. -Slice grapefruit and place in blender with all the other ingredients in top, but only using half of tstrawberry slices. -Once blended down to liquid form, pour a little into each pop mold, just enough to cover the base. 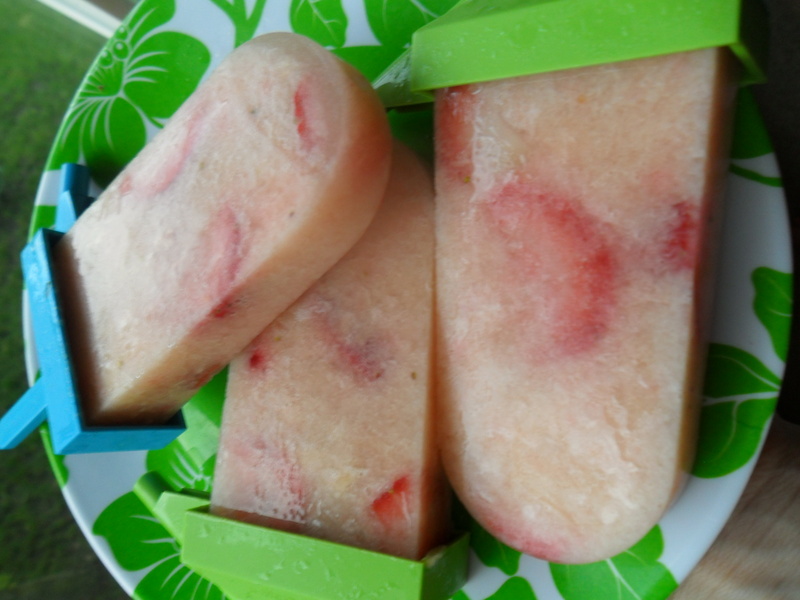 Drop in a few strawberry slices, add more of the liquid, slices, and so on and so forth until the moulds are full. Place the sticks in and freeze for 3-4 hours. -Directly prior to serving, remove from freEr and let sit at room temperature for about five minutes or run under warm water for 10 seconds or so. -Eat fast and enjoy liberally! 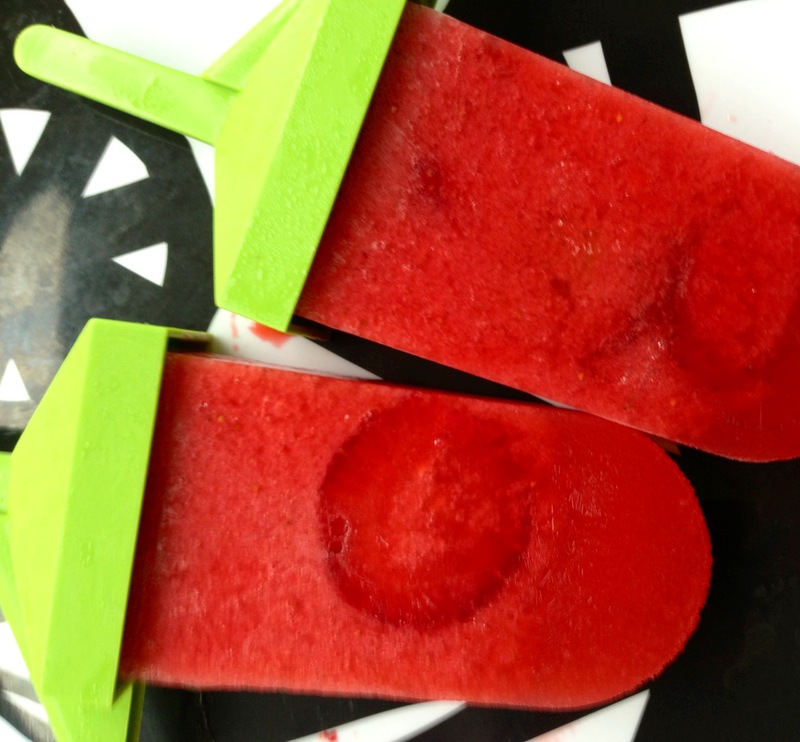 Nothing bad about these healthy, sweet pops. You know me. I love fun food. If it’s even a tad creative, then I have to try it. This one had been sitting on my Pinterest.com CC To-Do List board for quite some time. And once the semester had ended–my tortilla overload still under way–I decided to adapt the recipe I’d found online from Better Cookies, replacing regular dough with, you guessd it, whole-wheat tortillas. 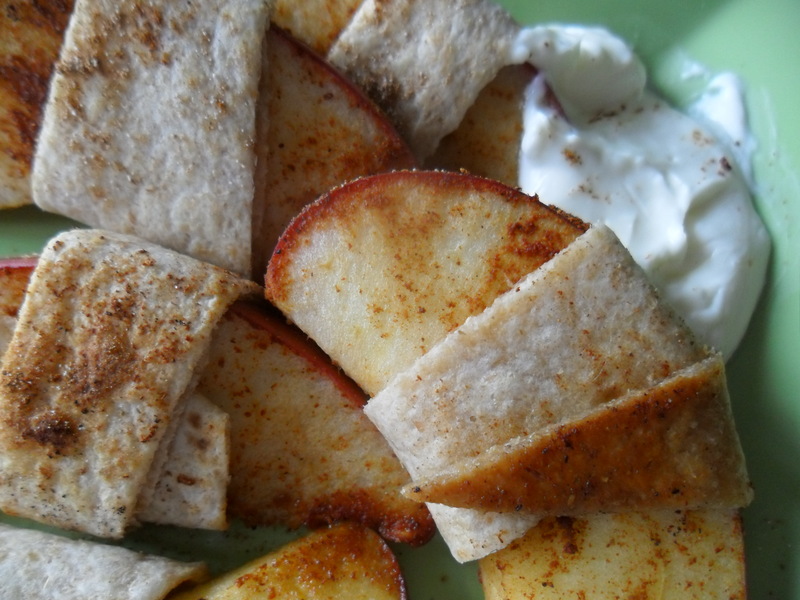 Ain’t nothing punnier, or truer than what I’m about to write: This quick and easy snack is now the apple of my eye. I’m not kidding. I say at this at the risk of not sounding very “American,” but the truth is that I kind of hate apple pie. Hold your fire. Be sympathetic. But I like my apples cool and crisp, not baked and spicy. Not sure why I enjoyed this recipe so much, not yet at least. It could be that I left the apples a bit thicker in terms of slicing. It could be that I wasn’t overloaded with apple mush, like most apple pies. Or it could just be that it was so easy to make and kind of fun. How can you go wrong? -Preheat oven to 400 degrees. Lightly grease a cookie sheet. Set aside. -Prepare apple by slicing lengthwise. You can make your slices as thin as you like for more, or thicker for fewer. Know too that if you go thicker, your apple pie snacks will come out less warm and gooey like apple pie, more crisp and fresh (just how I wanted mine). -Next, prep apples in seasonings. 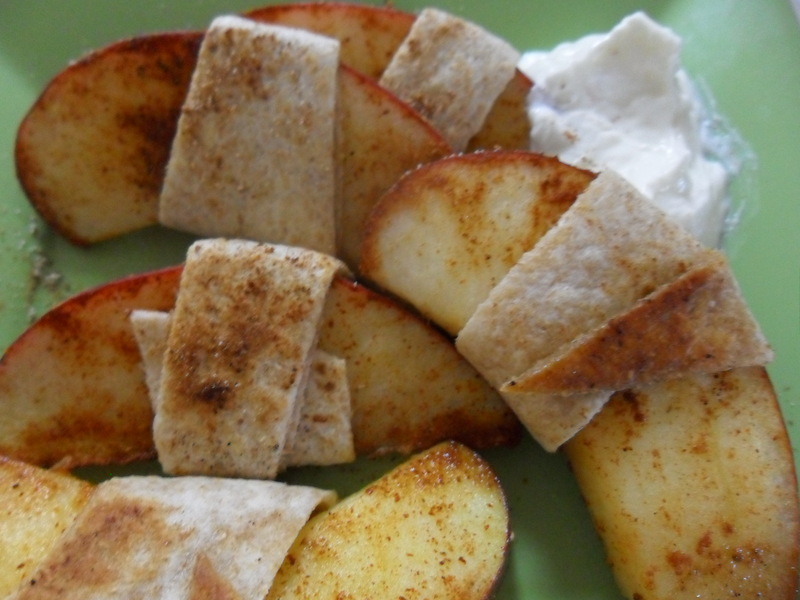 If you’re using the cinnamon-stevia blend, mix those two together and toss apple slices in those until coated. If you’re going the honey route, then still toss slices in cinnamon and then drizzle honey over the top. 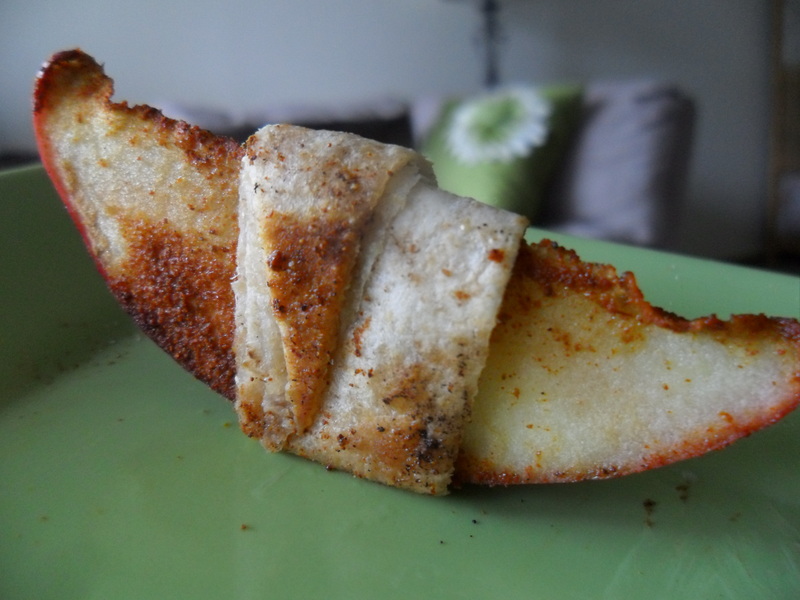 -Cut tortilla into strips. 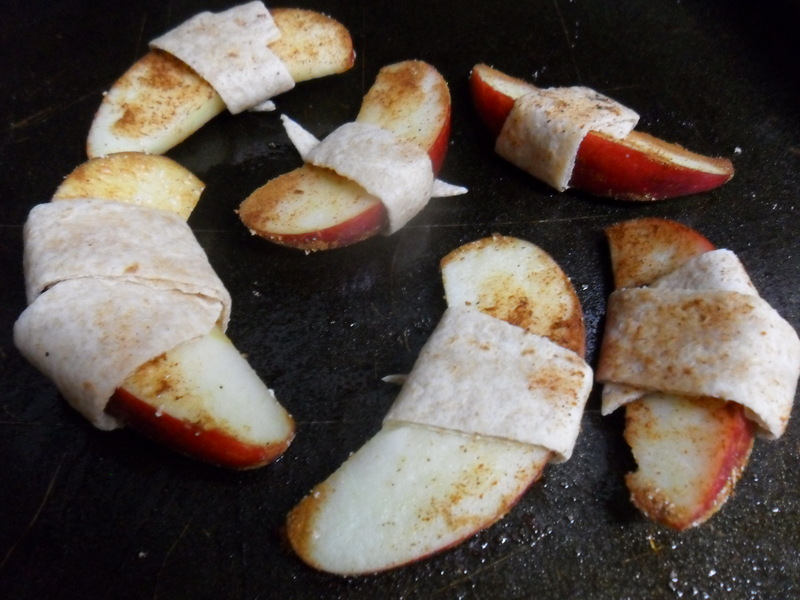 Roll one or more strips around each apple slice. Tuck ends of strip on bottom side or into the side of the wrap so they don’t unfurl. -Transfer to prepared cookie sheet. Sprinkle a little more seasoning or honey if desired and bake for about 8-10 minutes or until golden brown and somewhat soft. 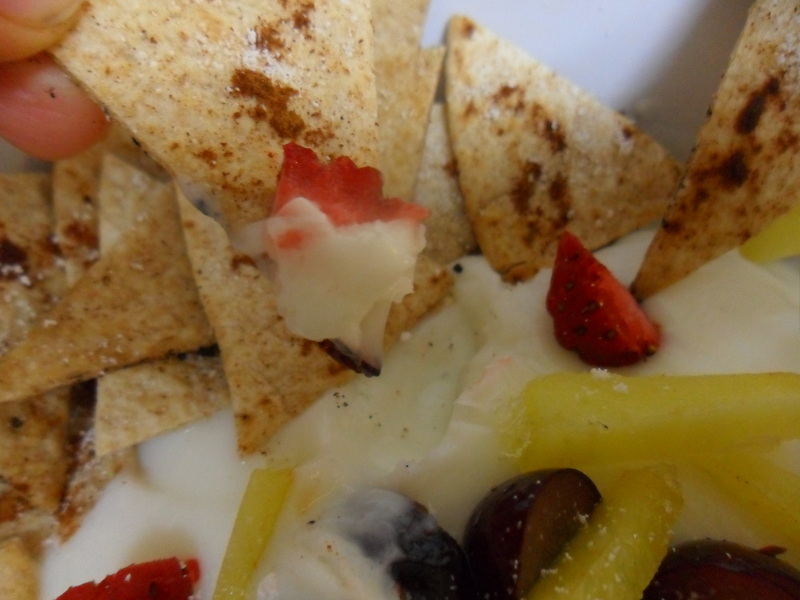 -Serve warm, right out of the oven, and with my healthified cream cheese dip, if you like. My first-world problem/ plight of having too many whole-wheat tortillas persists (read about my participation in a high-fiber nutrition study). All but two 10-ct. bags have been used up and all for savory dishes, tofu scrambles, bean and veggie burritos, burrito bowls, and much more. So I wanted to try something sweet. 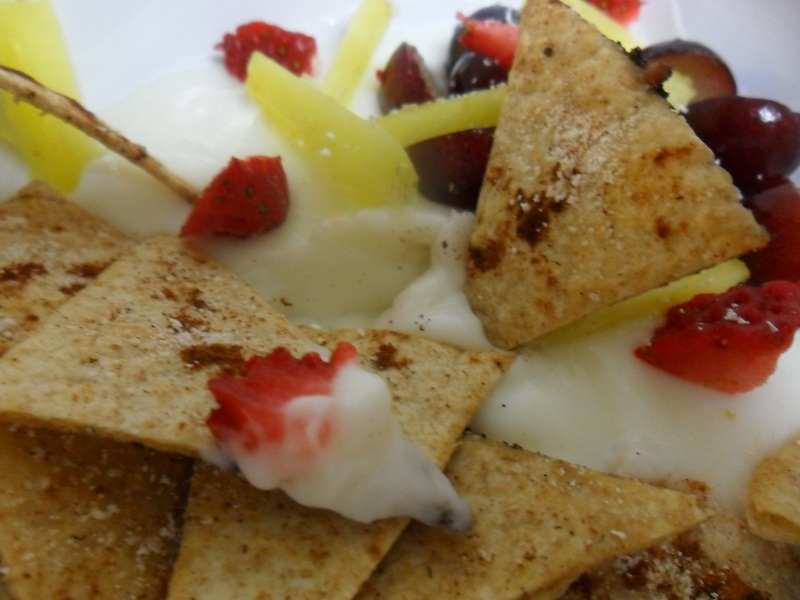 I’ve seen different dessert nacho recipes pinned on Pinterest for quite a while. I thought I’d dip into that. What I threw together was pretty good and super simple. This recipe makes enough for one, but you could easily double it. -If you haven’t already, slice your fruit and refrigerate to keep cool. 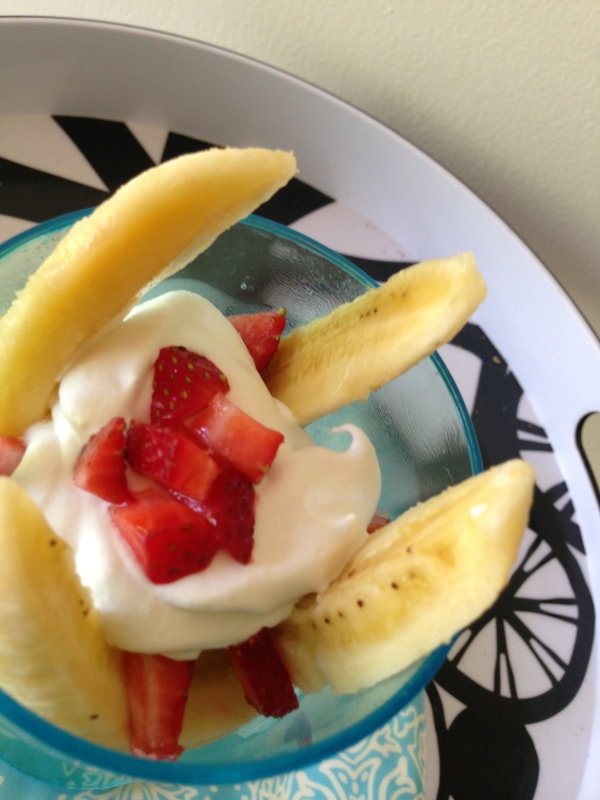 -To make the dip, mix the stevia and almond or vanilla extract into yogurt and blend thoroughly. You can use regular yogurt if you like, but I recommend plain since sugared varieties are, well, well-sugared. Return to refrigerator or freeze for about 40-50 minutes, churning occasionally, if you prefer more of a fro-yo consistency. 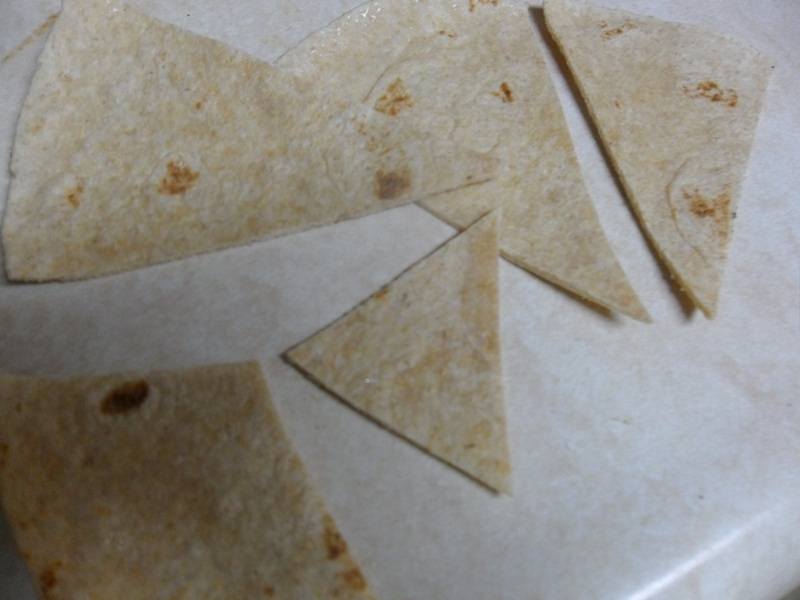 -To prep nachos, use a pizza cutter to cut your round tortilla into two halves. Cut each of those into three triangles. With each of your six triangles, cut a small triangle off the pointed end. With what’s remaining, you should be able to cut three more small triangles using a zigzag pattern. -Next you’ll want to lightly spritz a broil-safe pan with cooking spray. 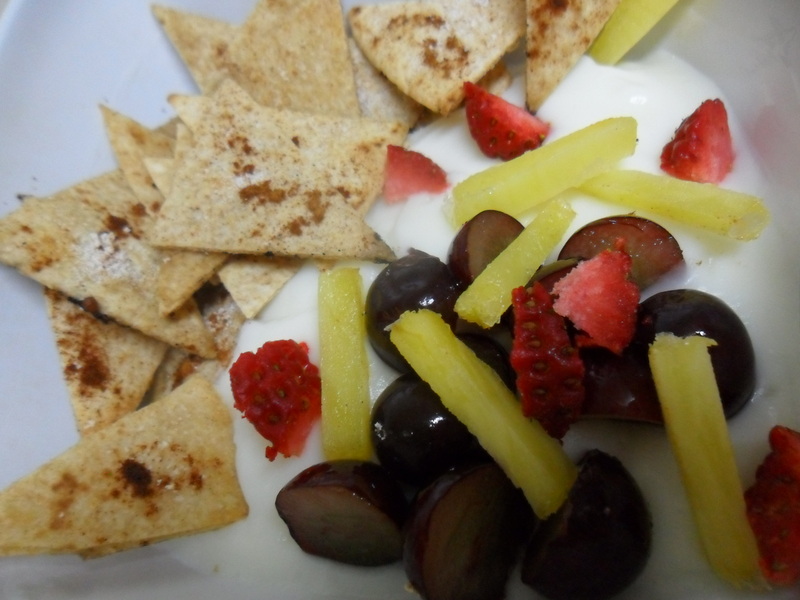 If you’re using a cinnamon-stevia blend, go ahead and mix those together now, lightly coat the chips with cooking spray, press into blend and set on pan. If you’re opting for honey, which works a little better in my opinion, lay on pan, drizzle honey over chips, then sprinkle cinnamon atop. -Broil for only a minute or so on that side. You’ll want to watch them carefully, and flip them quickly. If you’d like more sweetness, you can add more of either blend once you’ve flipped. Return to broiler and remove only once toasted. Let cool. Then you’re ready to dip. 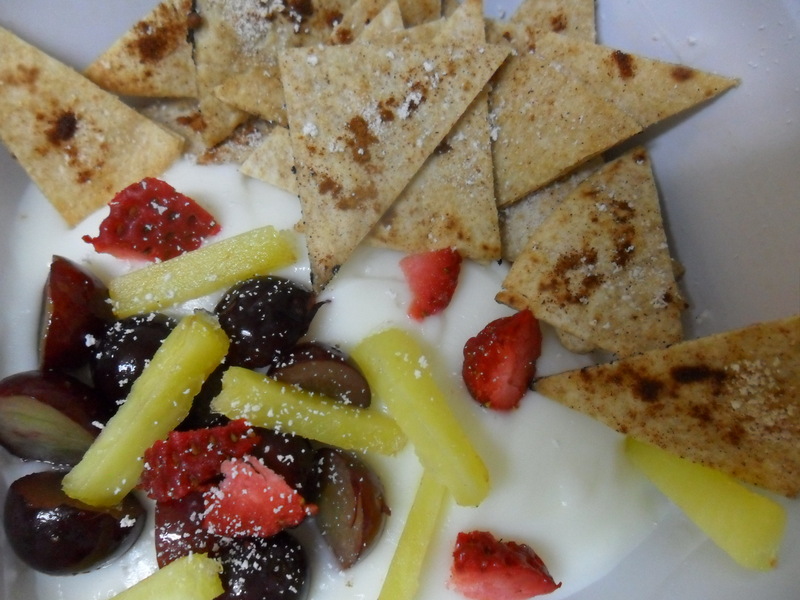 Place your fruit on top of your dip and scoop up something sweet and good. 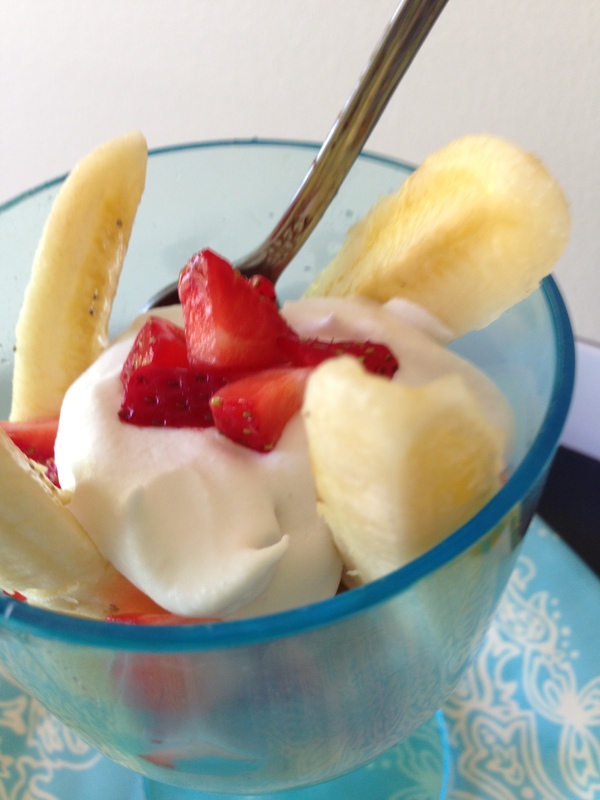 Sweet breakfasts can be so good. Berry-filled crepes, French toast, pastry tarts. All of which can be healthy. All of which I’ve posted on this blog. But what I dislike about sweet breakfasts (only slightly…) is that they aren’t the most filling. 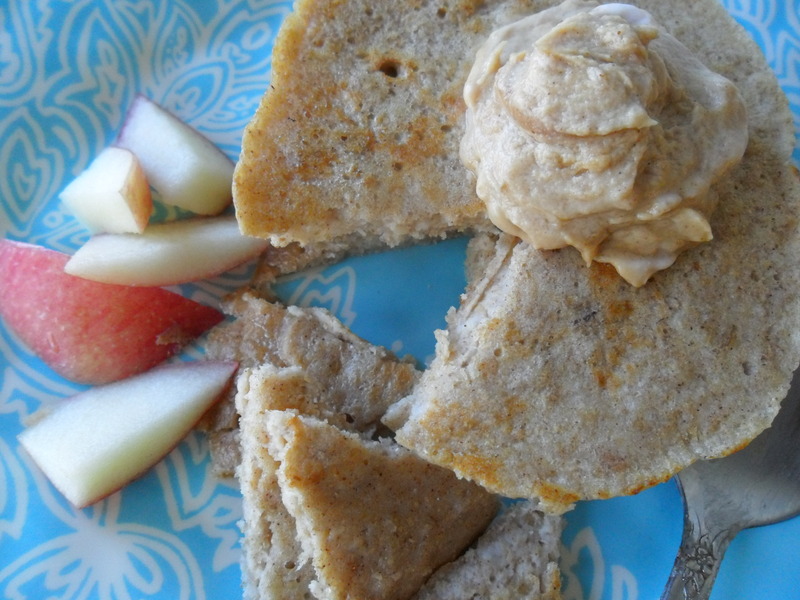 Normally, I have to add a little peanut butter for protein and lots of fruit for fiber. This recipe, however, is a sweet but stick-to-your-ribs kind of breakfast. The Greek yogurt and the hearty oats that can be mixed in make it very filling, enough to power you through any morning. –Heat your griddle to med-low setting. Lightly coat with cooking spray. Allow to warm. 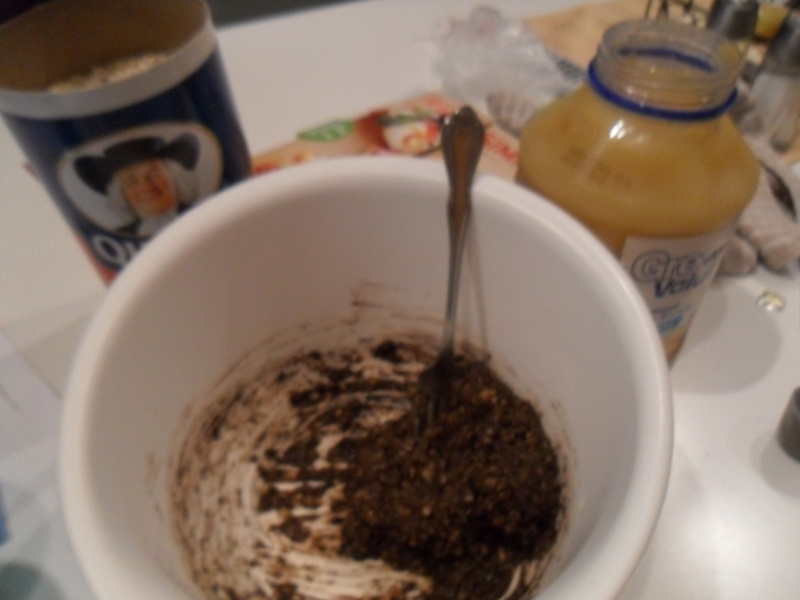 -In a small bowl, mix all dry ingredients well. Then slowly add in yogurt, then vanilla, and then water as you like. For thicker cakes, use less water. For a few more cakes that are thinner, add more water. -Pour pancake batter on griddle to the size of pancake you like. They will probably spread a bit. At this point, if you’d like to add in other ingredients, such as berries or chocolate chips, you can drop them on top while the bottom side of the cakes cook. -When the edges begin to firm up a bit and bubbles are popping up through the top side, the cakes should be solid enough to flip. Do so carefully. They should be golden brown on each side. Yes, I always have lots of these! 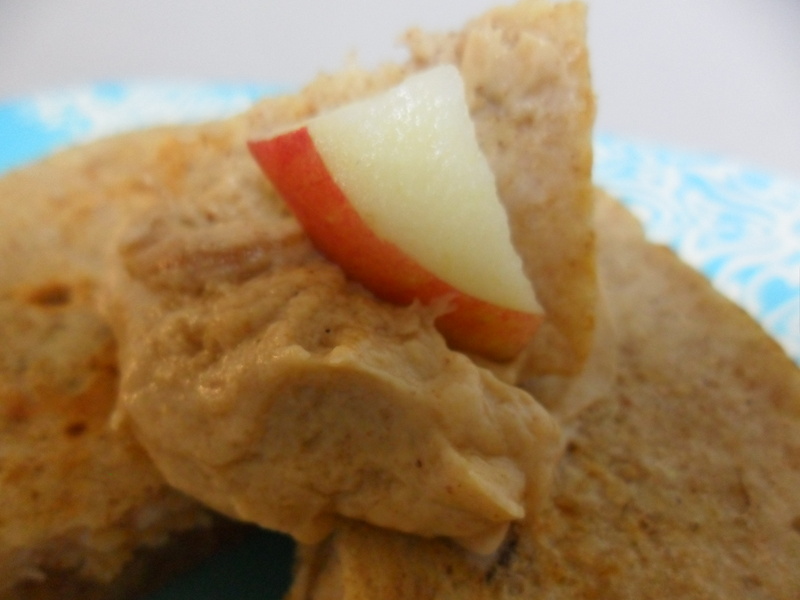 For this recipe, I mixed 1 T all-natural peanut butter with 1 T yogurt and a dash of honey. Fresh apples were chopped and added, too. Berries and honey would also be delicious. I made you a big breakfast cookie recipe this morning. 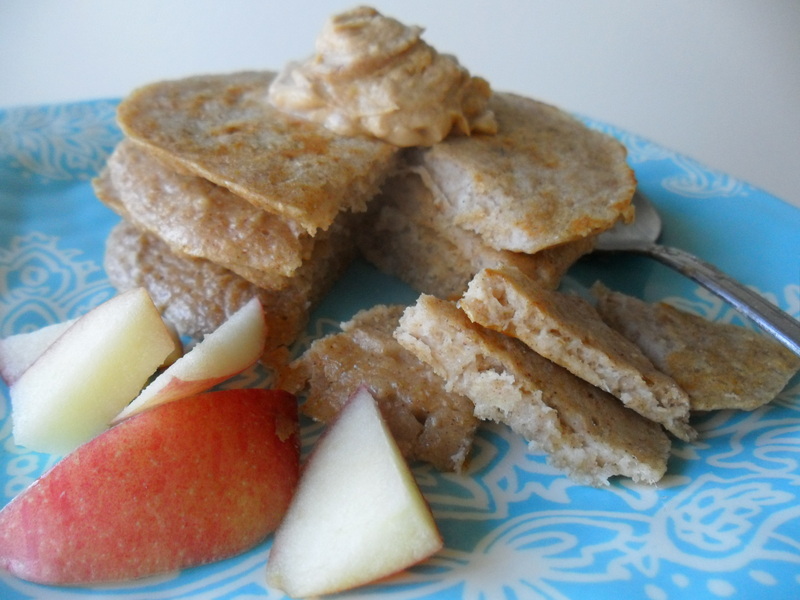 With all the healthful ingredients in this recipe, you don’t have to feel bad about eating the whole recipe. 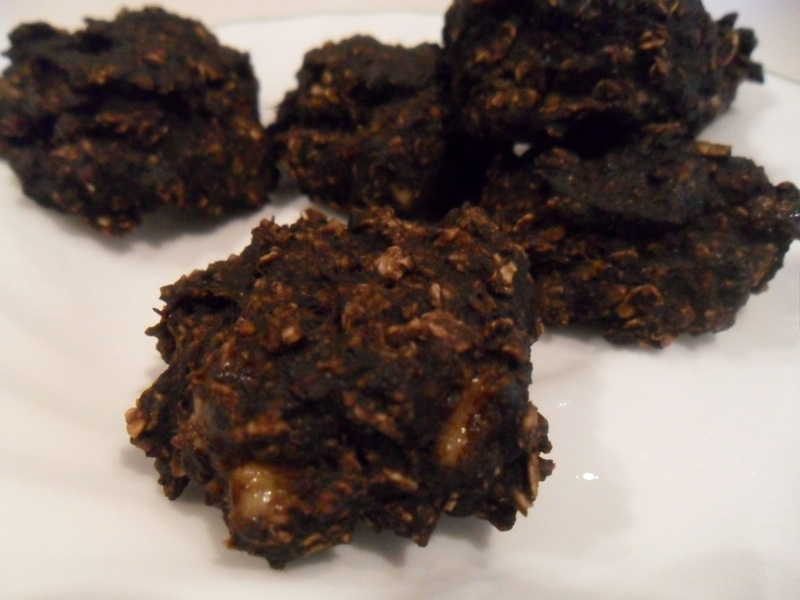 I mean, this is a low-calorie, nutritious recipe, so indulge yourself a bit! 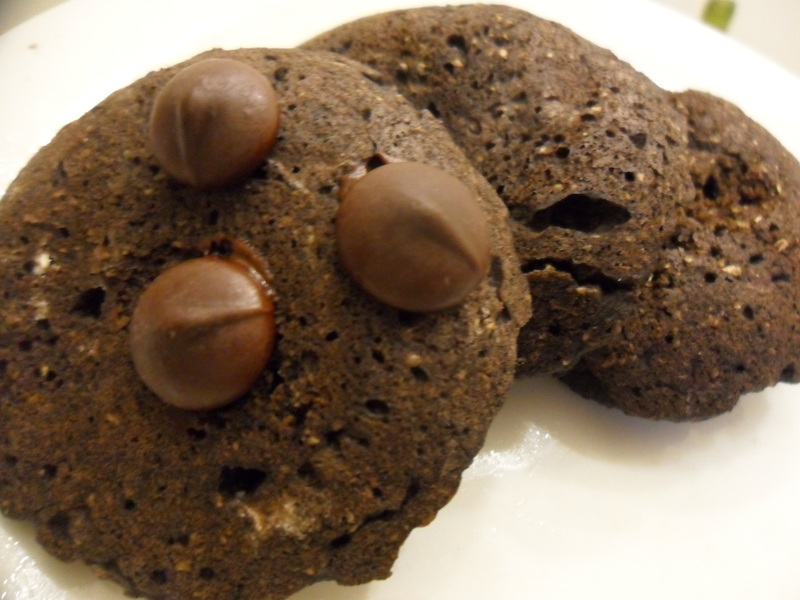 Make a batch of little cookies (8-10) or one or two giant cookies. I have a feeling you’re going to like this one–even my picky little sister did–and I bet it will keep your sweet tooth satiated for the rest of the day. -Preheat your oven to 350 degrees. Lightly grease a cookie sheet and set aside. -In a small bowl, mash up banana. If the banana is still too ripe to mash easily, you can ripen it quickly by popping it in the microwave for 15-20 seconds. -Once banana is well mashed, start working on dry ingredients in another, slightly larger bowl. Mix well. Then add in mashed banana, applesauce, vanilla, and nut butter. Again, mix all ingredients well, trying to make sure that most of the chunks of banana are no longer visible. -Bake for about 9-10 minutes. Per usual, the longer you bake, the crispier they’ll be. I think these taste so good super soft, but then again, I’m not a crispy-cookie kind of gal. You’ll just have to try it out and see for yourself! VitaTop muffins are oh so good, but hardly cheap. Why can’t we just make our own for less? 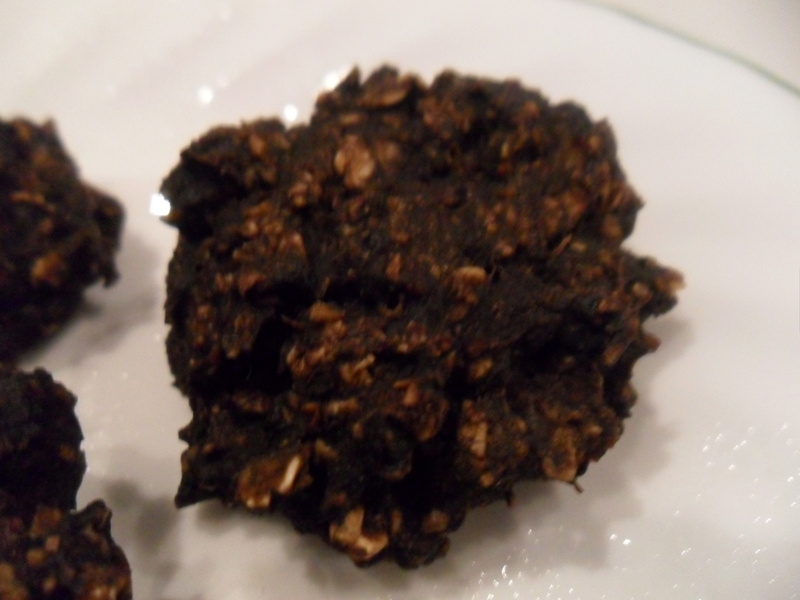 This recipe posted by Healthy is Always Better is pretty good, especially if you have a good food processor that can easily flour rolled oats. (I mention this because mine is not the best.) The more “floured-down” the oats, the better the dough. Oh, and if you’re confused about the cookie-muffin tops pictured above, well, I made them small enough to double as cookies, which I then made into ice cream sammies (pictured at the bottom of this post). Mmm.Mmm.Mmm! 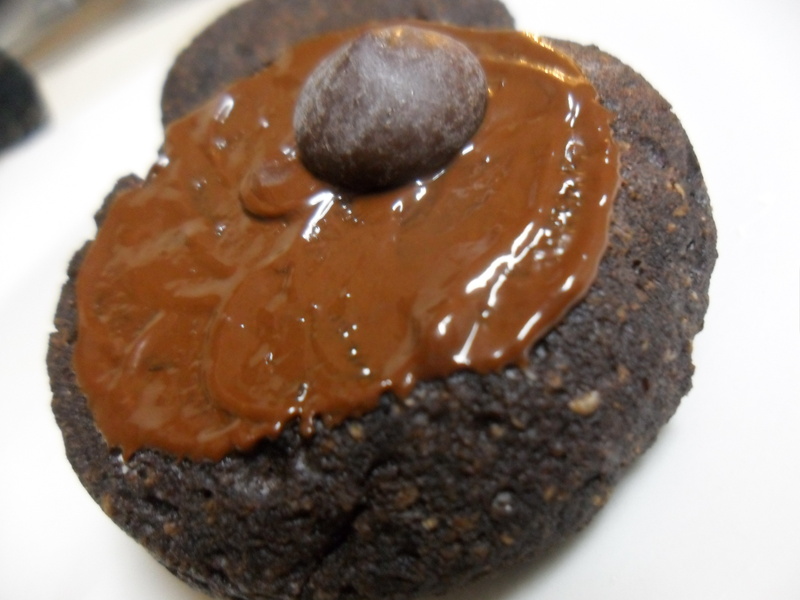 Makes 1 muffin or 2 medium-sized muffin tops. -Preheat oven to 350 degrees. 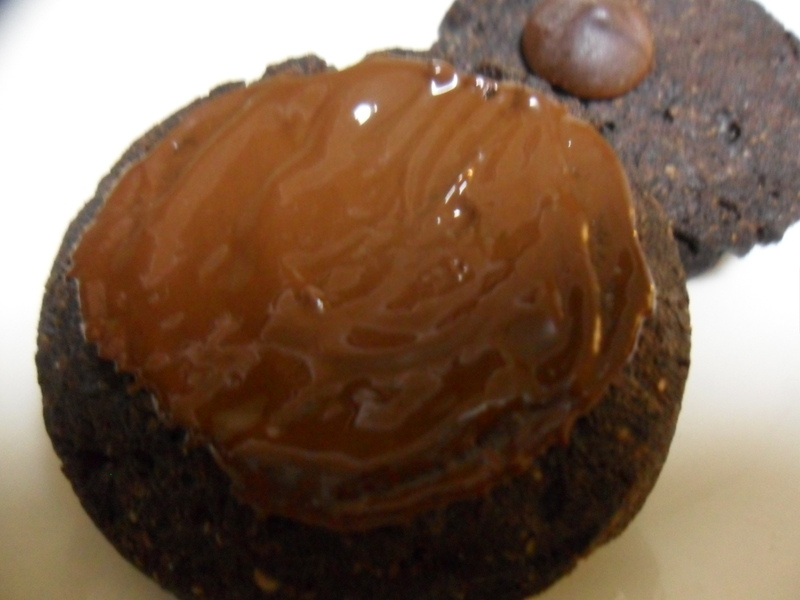 Use a cupcake liner or lightly grease a muffin tin. Set aside. 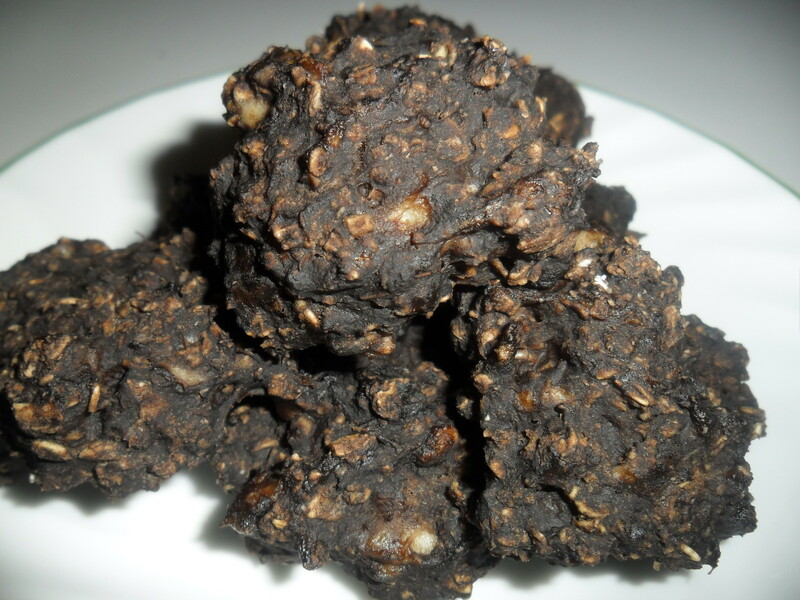 -In a food processor, mix all ingredients except chocolate chips. 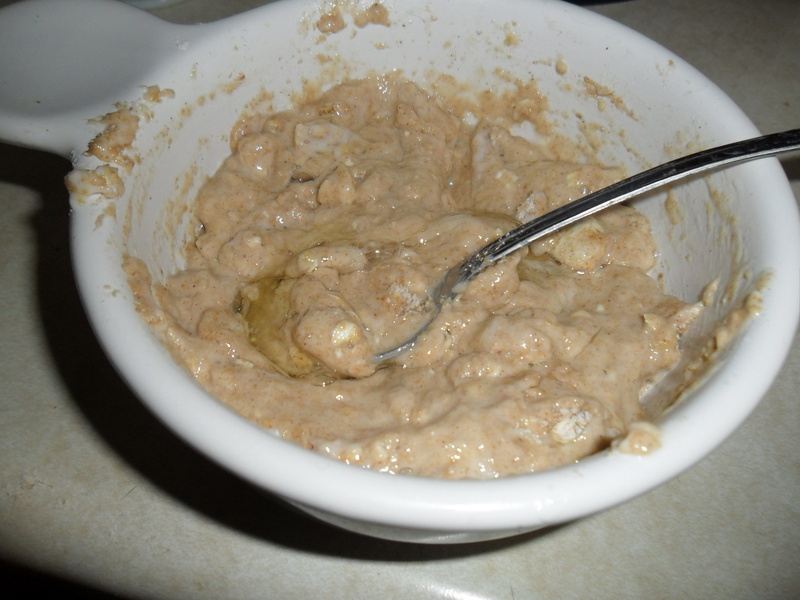 Blend until dough is smooth and well mixed. Remove and mix in chips. 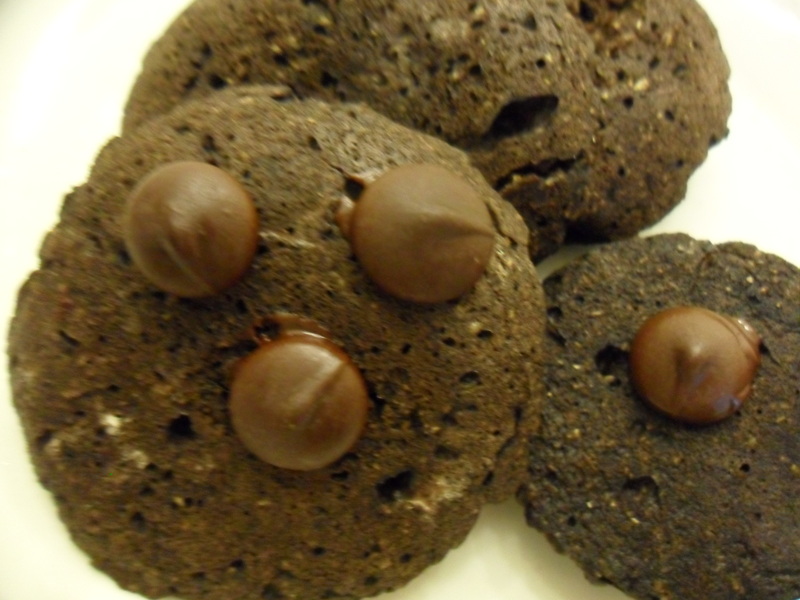 -Scoop dough into tin and bake for about 10 minutes. Remove and place a few chocolate chips on top for aesthetics :). -Place back in oven for another 2-3 minutes, or until you can insert a toothpick and it comes out clean. 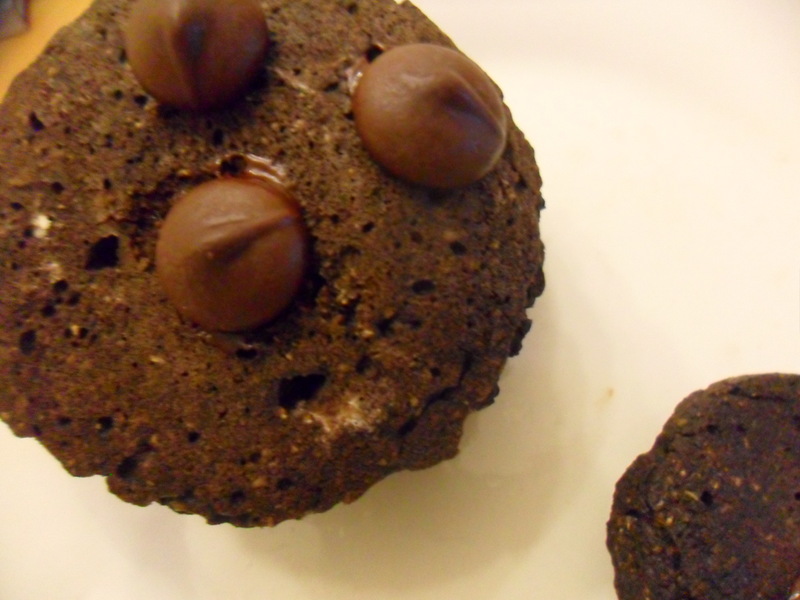 -Cool muffins (or muffin tops, or muffin ice cream sammies!) and enjoy.